Prank-Kids Dodo-Doodle-Doo is the RoTA for the decks spells and traps. 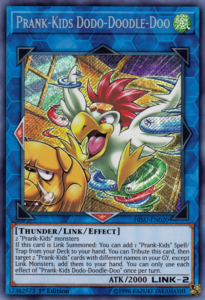 Link Summoning this bird is ridiculously easy and if you pop this card you’ll recover the Prank-Kids monsters used for the Link Summon as long as they aren’t Link Monsters. Recycle your Fusion Prank-Kids, get card advantage back, get ammo for Rocksies. Dodo-Doodle is a great attacker for a Link 2, and with the ATK/DEF dropping and raising Prank-Kids can do, this card could be troublesome for your opponent, though you want to tribute him. Dodo-Doodle can fix your hand with that search ability as well. All you need is a Prank-Kids monster in the opening hand and an Instant Fusion and boom, you get the spell/trap you need. Prank-Kids Pranks would cycle everything back in the End Phase and get you a draw, not bad for turn one. A searcher Link Monster is good. Prank-Kids Dodo-Doodle-Doo is a long “Winded” name for a Link 2 Wind Thunder-type Link Monster with 2000 Atk and with Left and Bottom Arrows. Pretty good stats for kids and for a Link 2. You need any 2 Prank Kids to properly Link Summon P-KDDD and then you can search a Prank-Kids Spell or Trap from your deck to your hand. As a second effect that does not require proper summoning, P-KDDD can tribute itself for cost to bring 2 different targeted Prank Kids cards from the grave to the hand. Each effect is once per turn, but adding resources to your hand is great to go into ways to win. And the 2000 Atk is really nice for when this gets revived. While the name is the only real downside, everything else really makes the archetype fly. These Prank-Kids Link Monsters have some wild names. Prank-Kids Dodo-Doodle-Doo is a Link-2 WIND Thunder with 2000 ATK and arrows pointing Left and Bottom. 2000 ATK seems to be the minimum for Link-2s that aren’t that difficult to summon, WIND is meh and Thunder is nice now, and those arrows give potential in the Main or Extra Monster Zones. The summoning requirements are any 2 Prank-Kids monsters, so those two will likely summon more from the deck. If this card is Link Summoned, you can add 1 Prank-Kids Spell or Trap from your deck to your hand. This along with two Prank-Kids monsters is getting some nice advantage for more plays along with something like a searcher, card recycler, or an option to Link or Fusion Summon on the opponent’s turn. Also you can tribute Dodo-Doodle-Doo on your turn to add two Prank-Kids cards back to your hand as long as they aren’t Link Monsters. There is another Link-2 in the archetype that does this on the opponent’s turn instead along with giving Prank-Kids immunity to effect destruction for said turn, so the Link Monsters are built to get resources back to your hand, for a potential Fusion Summon. The Fusion monsters on the other hand summon Prank-Kids monsters, possibly for Link Summons, as there are two Fusions that work on either your or your opponent’s turn and the one on your opponent’s turn gives Prank-Kids battle destruction. Just like how this won’t let you get back Link Monsters, the Fusions don’t re summon other Fusions, but they can revive the Links, and they are Instant Fusion targets. The smaller Fusions and Links are very similar in reviving or getting back resources, but Doodle here has the best effect upon being summoned since it searches, making it the best Link Monster. Art: 4/5 What are those kids creating in their room? Prank-Kids Dodo-Doole-Doo…what a clever name. Let’s see, Thunder, Wind, (both of which are under appreciated but have more support now than ever before) Link 2, with a reasonably sound 2000 attack. Appropriately enough, this card needs two Prank-Kids to be Special Summoned, but any two, even the same two Kids, if you so choose to do so. We see the Link Arrows here point directly left, and below this card. Let’s see, a Link Summon gets you a theme Magic/Trap card from your Deck to your Hand, so that’s a free +1 right there. He can be Tributed to add two (differently named) Prank-Kids from your Graveyard back to your Hand. They can’t be Link Monsters, but this bird is here to help give your resources back to make a bigger play you couldn’t before he hit the Field. Each effect can only be used once per turn (shows shocked face). The 2000 attack isn’t terrible (again, given being Link 2) and whatever you bring back from your Graveyard is likely going to lead to a Fusion (or possibly another Link Summon) but if you need at the time, I’m assuming Fusion. Link would likely require at least one more turn for you to set up. Art: 4/5 also…That dog doesn’t seem to care much, despite the annoyance/tiredness shown on his face about the crazy bird behind him.